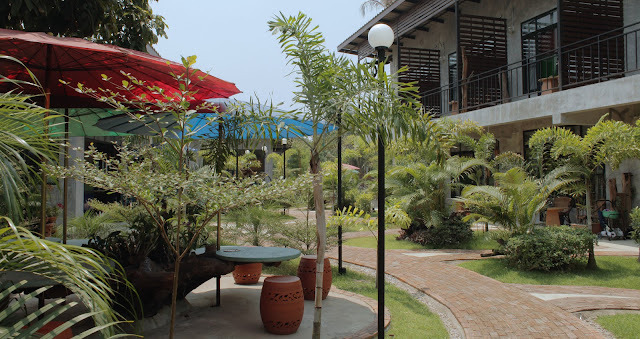 The beautiful grounds of the Picturebook Guesthouse in Mae Sot. The camp hall at the Umpiem Burmese refugee camp near Mae Sot. We attended the graduation of the students in the English Immersion Program at the camp. Part of the refugee camp and the surrounding mountains. A typical classroom in the camp. Illegal border crossing between Thailand and Burma. Greg, Sandy and Rochelle took us to this amazing restaurant. The designers literally took pieces of the jungle and transplanted them here. Waterfalls and jungley stuff at the restaurant. Even the bathrooms were all jungled out. The amazing Ro, Sandy and Greg were warm and gracious hosts. They definitely made us want to come back and see them again soon. Sometimes when you are traveling there are these side trips that seem like they will be a lot of work, and when you are short on time or money, you wonder if they will be worth it. We have finally figured out that when we follow our gut and persevere we are more richly rewarded than we could have expected. We really wanted to visit Matt's friend and old co-worker Rochelle in the town where she had been working for the past 3 years. It would take a day there and back, and we didn't know what else there was to see or do in the town. We decided that it's always fun to visit old friends in new places, and how often do you get a local's tour from someone who shares your history and knows your reference points? Mae Sot is a small city on the border of Burma. It's home to multiple burmese refugee camps, many Burmese migrant workers, and a healthy NGO population. It is a potential overland entry to Burma (right now only for a day trip but maybe longer in the future) via the Friendship bridge. It's also a bustling illegal crossing (by boats or inner tubes) under the watchful eyes of the Thai military. Point B Design + Training has been created to respond rapidly and flexibly to needs in Burma/Myanmar. More than 60 years of military rule in Burma/Myanmar has eroded both the capacity for critical analysis and the confidence to propose solutions that are mutually agreed upon by both the government and local communities. Over the last 14 years, the founders of Point B have developed trainings, tools and processes to empower educators, community mobilizers, community organizations and leaders to deliver innovative solutions within a complex and changing environment. Point B is focused on developing education systems and community governance in Burma/Myanmar through the following methods:• Develop master trainers who can lead change and facilitate action within schools and communities. • Use an interdisciplinary approach that brings together education, business, design-thinking, health and science to enhance local capacity and performance.• Tackle social issues and use prototyping to discover new solutions.• Create new platforms for collaboration between diverse social, ethnic, gender and political groups. Early the next morning we took a long winding drive up to Umpiem, one of the Burmese refugee camps in the mountains. It's usually hard to get visitor passes to the camp, but since it was a special occasion (the English Immersion Program's graduation day) we were able to get through the gate. Umpiem has been in existence since 2000, and, according to The Border Consortium, has 17,000 residents (with an additional 10,000 having been resettled from the camp to date). The camp was described to us as one of the more picturesque refugee camps, and it certainly was. Thatch roofs spread across deep valleys, bamboo huts with decorative weaving and interesting architectural elements (balconies with built in seats!?!). It's enough to make you forget the history of people forced from their homes by violent conflict, living on meager rations and confined to a 1/3 sq mile camp all day, every day. The public buildings bear the reminders of all the aid camps like this require, "provided by US Aid", "donated by Australia aid" etc. There is hope that with peace and stability in Burma people could start to go home, but as Greg explained, people have every reason to remain very-cautiously optimistic. After camp we saw a couple of the migrant children's schools, watched people making the illegal crossing to and from Burma by river, and stopped by PuzzleBox art studio. Sein Sein Lin is a Burmese artist who helped design all of the rooms at our guesthouse, does gorgeous watercolors and teaches art and ceramics to local kids. I was more than happy to buy some Puzzlebox jewelry and art from our guesthouse store, but regret I didn't get a copy of the children's book illustrated by Sein Sein Lin and written by Rochelle. We finished our tour by visiting the Mae Tao Clinic, a health clinic run for displaced Burmese by a Burmese doctor, Dr. Cynthia. The clinic and hospital wards were admittedly basic, hospital beds with wooden planks kind of basic (no air cushion pressure ulcer prevention here!) with outdoor toilets/bathing areas. It's hard to see and not make judgements based on western values, especially without knowing how their health outcomes measure up. Once again I am reminded of how soft most of us in the west have become. Later that night we all went to dinner at this insane restaurant. The owners imported a substantial chunk of the jungle onto the grounds of the restaurant, complete with massive trees, all kinds of orchids, and limestone boulders. 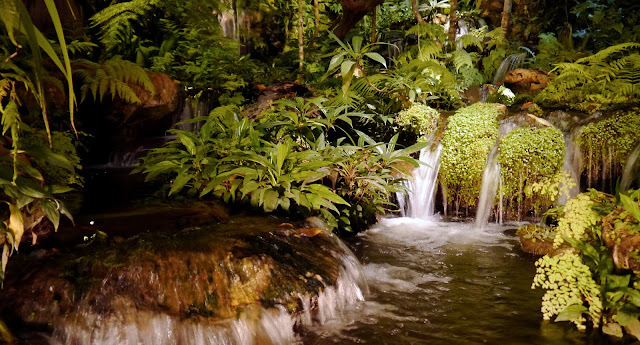 Small ponds and several waterfalls surrounded us as we ate very good Thai food. The real draw of the place is the jungle atmosphere. It was pretty over the top in a sort of Disney way, but done tastefully. Honestly, I wouldn't mind living there. The generosity and hospitality that Rochelle, Greg and Sandy showed us while in Mae Sot was wonderful and humbling. They are super passionate about their work in the face of daunting challenges. We wish them the best of luck and look forward to following their progress in Point B Design + Training. Hopefully we can see it firsthand in Burma in the near future.